City officials do not want you to throw garbage out in this manner. Instead, make sure garbage does not overflow from your trash container and do not put more than one bag of trash out next to it. 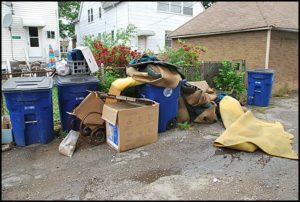 The city’s DPW reminds residents that trash containers should always be kept out of alleyways except from 6 p.m. the night before pick-up through 9 p.m. the night of pick-up. Lids should be able to close tightly; do not overfill containers. One large item only may be placed for pick up next to the container. Alleys should be otherwise kept clear. These policies are in part there to stem the potential presence of rats. To this end, tips include: the elimination of excess bird seed on the ground if you have a feeder; the removal of any food, especially fruit and vegetables left over in gardens or spilled out of rubbish; the clearing of weeds, long grass and other vegetation from your area of the alley; and the removal of any debris around houses or in alleys that could provide shelter to rodents, such as (for example) old mattresses, appliances or tires. If your water meter has not yet been upgraded, you are asked to schedule an appointment with the DPS at (313) 800-5233 to do so. There is no cost for this upgrade, and bills could be positively impacted by more accurate readings. The DPS says that the entire swap-out process normally only takes 25 to 35 minutes to perform. Methods of calculating water bills have been changed, based on a citywide rate study completed this past July. Bills are now based on two factors: the size of the residential meter, and usage. Contact the DPS for further clarification. Snow removal is the responsibility of the occupant or owner. If you rent, you may want to get with your landlord and make sure it is understood who is ultimately responsible (generally, that may be the property owner, unless a specific wording has been added to the lease placing the responsibility on the lessee). If there is no actual sidewalk, a path must still be cleared across grass or dirt, for example. The responsible party has 12 hours to clear new-fallen snow; the city does not specify what minimum amount must have fallen. This applies to all properties, residential, commercial or industrial. In addition to designated fire routes, during a city-declared snow emergency parking is also temporarily forbidden on the city’s four major thoroughfares, specifically Jos. Campau between Carpenter and Hamtramck Dr., Conant between the same, Caniff between Grand Haven and Buffalo, and Holbrook between St. Aubin and Buffalo. Hamtramck is one of 22 Michigan cities that charges residents and businesses a city income tax, as well as non-residents who work in the city. You are required to file a return, or a request for extension, by April 30. Specific questions can be answered by the Tax Department at (313) 800-5233 extension 819, Monday through Friday from 8 a.m. to 4 p.m., except during holiday closures. With cold weather coming early this year, the Fire Department reminds residents about the safe use of space heaters. Heaters should be laboratory tested and approved models with thermostats and automatic shut-off functions in case the heater gets tipped over or overheats. They should be kept at least three feet away from anything flammable, such as papers or fabrics, and kept out of the reach of young children, and kept from blocking doorways. Always plug space heaters directly into the wall, and avoid using extension cords unless they are the type specifically rated to handle space heater draws on electricity, which are normally very high. Don’t plug more than one in per two-hole outlet. Place them on solid, flat services, and always unplug them when leaving the house or before retiring to bed. Finally, Police Chief Anne Moise is in the process of creating a Chief of Police Advisory Council, and is currently considering applications for 12 potential volunteer community members to be part of it. It is hoped that the council will help implement an improved strategy for the department to communicate more efficiently with city residents and businesses. That’s it for now – have a great “fall” (such as it was; did it even really come this year?) and get ready to get cozy (however you do) for the long Hamtramck winter ahead.